Students in CSE got the chance to network and celebrate diversity in computing at the 2018 Richard Tapia Conference, which took place in Orlando, Florida on September 19 - 22. This year’s conference theme was “Diversity: Roots of Innovation,” acknowledging the historical role of diversity in STEM innovation and its essential role in innovating the future. 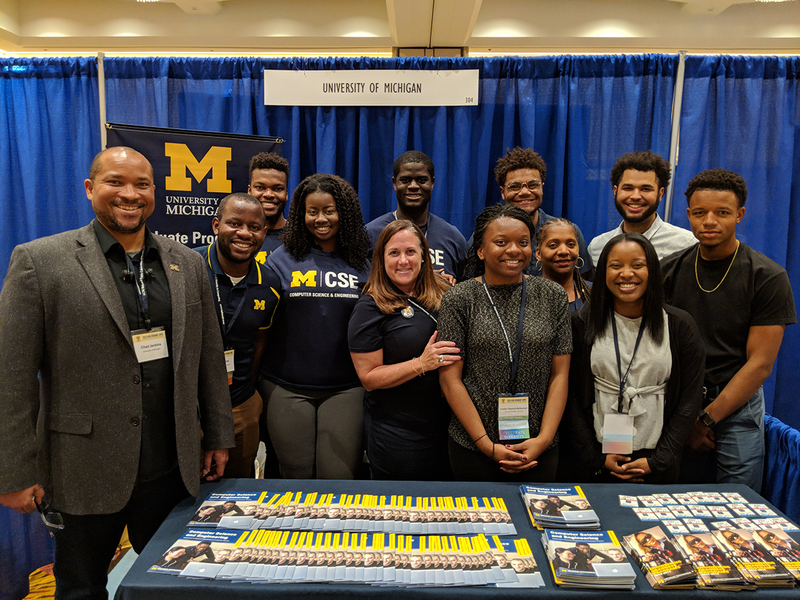 CSE staff attended the conference’s exhibition hall as an event sponsor, and were able to connect with a number of students regarding programs of study in computer science and engineering at Michigan. Eight students from CSE traveled to the conference this year, marking a new highpoint in attendance. This year’s attendees were Tutu Ajayi, Nathan Baker, Keaton Bonds, Akin Coffy, Joseph Nwabueze, Chalse Okorom, Lee Rutledge, and Kayla Williams. The students were accompanied by Prof. Chad Jenkins, who worked with Akin Coffy and Lee Rutledge to up this year’s attendance with the help of their new student organization for underrepresented minorities in CS. Jenkins strives to improve the state of diversity in computing and robotics with the goal of realizing equal opportunity for all. This is his fourth year leading students to participate in the Tapia Conference. CS grad student Lee Rutledge talking with another attendee at the U-M booth. This year, Jenkins established the first Michigan-Harvard dinner at the conference with Harvard professor Radhika Nagpal. 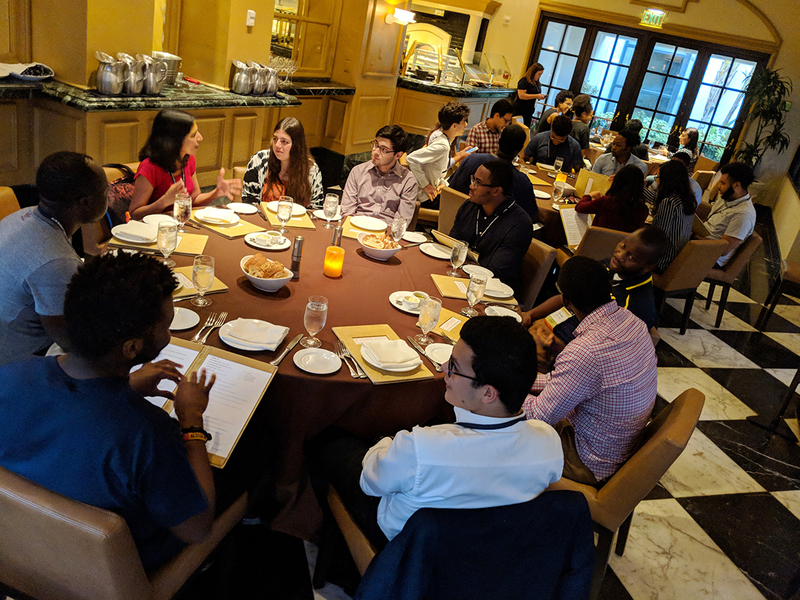 The dinner gave the two institutions’ students insight into their differing experiences, as well as a chance to talk about the different ways they hope to enter the computing field. “It doesn’t hurt to talk with some great prospective graduate students and future faculty,” Jenkins adds. Students in attendance valued the chance to connect with professionals from across the nation and across different industries. Coffy, a second-year student on his first trip to Tapia, was so focused on what he’d be doing at the event that he was shocked to see the diversity of the crowd when he arrived. Michigan and Harvard students attending the conference met for the first ever Michigan-Harvard Dinner. The students sought out career connections with companies and schools from around the country, networked with other participants, met with leaders in industry, explored graduate school opportunities, and attended workshops relevant to their goals. Grad students in attendance got the chance to offer their experienced perspectives to the conference’s undergrads. Coffy says that he hopes to see the trend of increased student attendance continue at Tapia and other conferences throughout the year. His organization, tentatively called MinoriTeas for their tea-time weekly meetings, works to make the trip easier and more affordable for the students with funding assistance. This year, the University supported the students with not only attendance and travel costs, but a food stipend for the week. This is CSE's third year sending students to the conference, and Rutledge has attended every time. The experience was part of what inspired him co-found the student org with Coffy. CSE Chair Brian Noble, who also attended the conference, plans to continue its support for attendees and presence at the exhibition hall. This year, the division was a platinum sponsor for the conference. Additional support for U-M students in attendance came from alumni donors Peter and Susan Lee.